ADDRESSMoneen Industrial Estate, Castlebar, Co.Mayo. High performance sport and the importance of successful performances have led athletes and coaches to continually seek any advantage or edge that may improve performance. Enhancing recovery will depend on the type of activity performed, the time until the next training session or event and equipment or personnel available. Restricting sleep to less than 6 hours per night for four or more consecutive nights has been shown to impair cognitive performance and mood, disturb glucose metabolism, appetite regulation and i mmune function. There is only a small number of studies that have examined the effect of partial sleep deprivation on athletic performance. However, athletes suffering from some degree of sleep loss may benefit from a brief nap, particularly if a training session is to be completed in the afternoon or evening. Naps that are no longer than 40 minutes can be beneficial when learning skills, strategy or tactics in sleep deprived individuals or for athletes who have to routinely wake early for training or competition. Leeder et al. 2012 compared the sleep habits of 47 elite athletes from Olympic sports and discovered that the athletes had a total time in bed of 8 hours 36 minutes per night. Avoid watching television and using the computer in bed. Avoid caffeine approximately 4 to 5 hours prior to sleep. Do not go to bed after consuming too much fluid as it may result in waking up to use the bathroom. Create a good sleep routine by going to bed at the same time and waking up at the same time. Information regarding this intervention is largely anecdotal. What we do know for sure, according to Wilcock et al. 2006, is the human body responds to water immersion with changes in the heart, peripheral resistance and blood flow, as well as the skin, core and muscle temperature alterations. We are now beginning to see increased research into water immersion, recovery and perfor mance. The most common forms are cold water immersion and contrast water therapy, where the athlete alternates between hot and cold water immersion. These two methods appear to be the most beneficial according to the available literature. 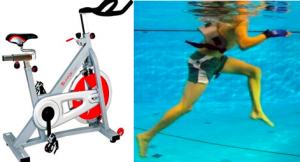 This generally consists of aerobic exercise which can be cycling, jogging, aqua jogging or swimming. Active recovery is better than passive recovery as it enhances blood flow to the exercised area and clearance of lactate and other metabolic waste products via increased oxygen delivery (Vaile et al. 2010). These are thought to improve venous return through application of graduated compression of the limbs. This external pressure created may reduce the intramuscular space available for swelling and promote stable alignment of muscle fibres, kick-starting the inflammatory response and reducing muscle soreness. While the evidence at present is minimal, there does not appear to be harmful effects relating to their use. A widely used recovery strategy with some elite athletes often getting 1 to 2 treatments per week. Increased blood flow is one of the main mechanisms to improve recovery along with the clearance of metabolic waste products. Massage is also beneficial in improving psychological aspects of recovery (Weerapong et al. 2005). Here at The SISM Clinic we can help in your recovery from sport with services such as sports massage, soft tissue release, stretching and mobility programs and expert advice. We also stock a wide range of products to aid recovery. No Comments to "Recovery Techniques for Athletes"